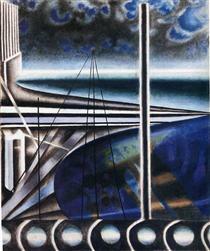 Joseph Stella (born Giuseppe Michele Stella, June 13, 1877 – November 5, 1946) was an Italian-born American Futurist painter best known for his depictions of industrial America, especially his images of the Brooklyn Bridge. 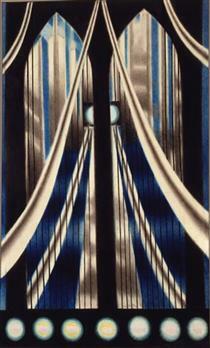 He is also associated with the American Precisionist movement of the 1910s–1940s. 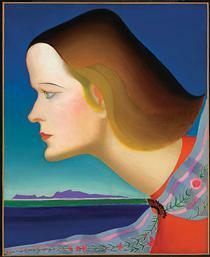 Stella was born to a middle-class family in Italy, in Muro Lucano, a village in the province of Potenza. His grandfather Antonio and his father Michele were attorneys, but he came to New York City in 1896 to study medicine, following in the foot steps of his older brother Doctor Antonio Stella. However, he quickly abandoned his medical studies and turned instead to art, studying at the Art Students League and the New York School of Art under William Merritt Chase. His first paintings were Rembrandtesque depictions of city slum life. 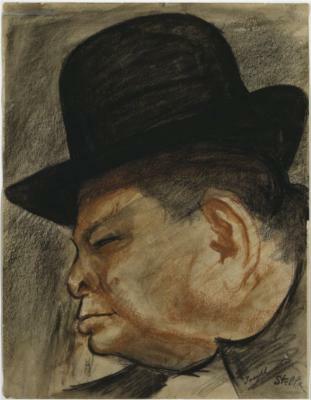 A remarkable draftsman, he made drawings throughout the various phases of his career, beginning as an academic realist with a particular interest in immigrant and ethnic life. 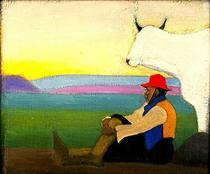 From 1905 to 1909, he worked as an illustrator, publishing his realist drawings in magazines. "He prowled the streets, sketch pad and pencil in hand, alert to catch the pose of the moment, the detail of costume or manner that told the story of a life." 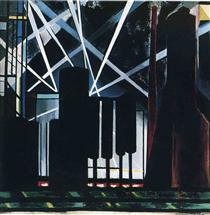 In 1908, he was commissioned for a series on industrial Pittsburgh, later published in The Pittsburgh Survey. Stella returned to Italy in 1909. He was unhappy with America, writing that he longed to be back in his native land after "an enforced stay among enemies, in a black funereal land over which weighed ... the curse of a merciless climate." It was a well-timed decision. His return to Europe led to his first extensive contact with Modernism which would ultimately mold his distinctive personal style, notable for its strong color and sweeping and dynamic lines. By 1911, he had departed Italy, where the omnipresence of the Renaissance presented its own kind of obstacle for contemporary painters, and relocated to Paris. 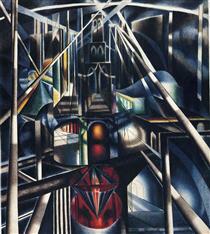 When he arrived, "Fauvism, Cubism, and Futurism were in full swing," he wrote, and "[there] was in the air the glamor of a battle." It was the right place to be, at just the right time, for a man of Stella's curiosity, openness to new trends, and ambition. In Paris, Stella attended the salon of Gertrude Stein, where he met many other painters. "[Stein] found the big and boisterous painter rather like [her friend, the poet] Apollinaire; they both had a fund of sarcastic wit that was frequently turned on their hosts." 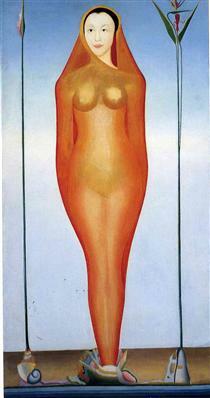 Stella's view of his hostess was indeed sarcastic: she sat, he wrote, "enthroned on a sofa in the middle of the room," surrounded by her Cézannes and Picassos, "with the forceful solemnity of a pythoness or a sibyl ... in a high and distant pose." 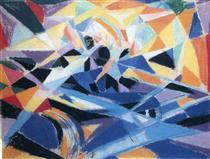 Having met Umberto Boccioni and befriended Gino Severini in Europe, he became associated with the Italian Futurists and began to incorporate Futurist principles into his art, though he was also interested in the structural experiments of the Cubists and the dynamic color of the Fauves. Returning to New York in 1913, he was prepared to give the United States a second try. It was a decision he did not regret, although, as art historian Wanda Corn noted, "his culture shock never abated." 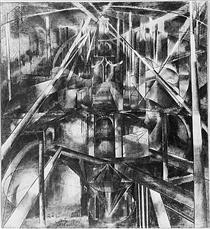 He became a part of the Alfred Stieglitz and the Walter Arensberg circles in Manhattan and enjoyed close relationships with fellow expatriates Albert Gleizes and leader of the New York Dada movement Marcel Duchamp (Stella and Arensberg accompanied Duchamp to the plumbing supply store in 1917 to purchase the infamous urinal.). As a result of these associations, he had almost as many opportunities as he had known in Europe to be among kindred spirits and to see advanced new art. 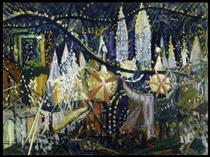 In 1913–14, he painted Battle of Lights, Coney Island, one of the earliest and greatest American Futurist works. 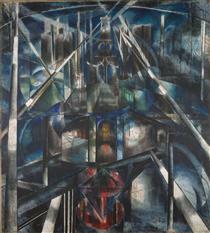 The legendary Armory Show of 1913, in which he participated, provided him with greater impetus to experiment with modernist styles. 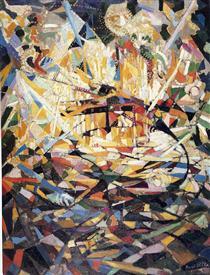 Der Rosenkavalier (1914) and Spring (The Procession – A Chromatic Sensation) (1914–16) are vigorous color abstractions. 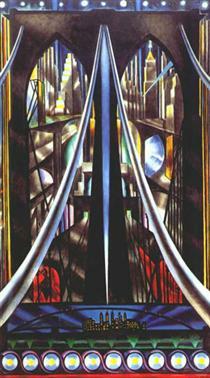 Metropolitan Port Joseph Stella ? 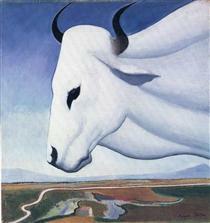 The Ox Joseph Stella ? 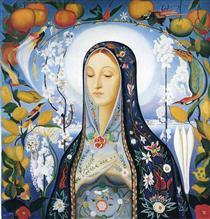 The Virgin Joseph Stella ? 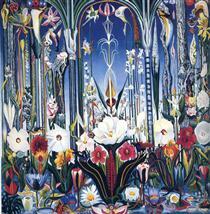 A Vision Joseph Stella ? 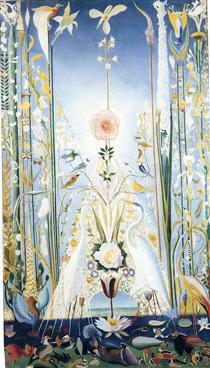 Apotheosis of the Rose Joseph Stella ? 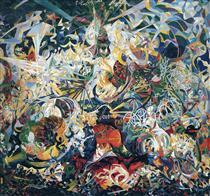 Battle of Lights, Coney Island Joseph Stella ? 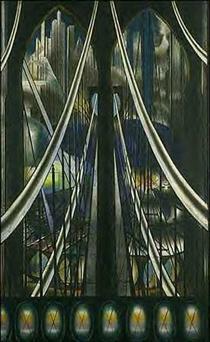 Brooklyn Bridge Joseph Stella ? By-Products Plants Joseph Stella ?